Touch the new way of printing with the Océ PlotWave 340/360 printing system.The Océ ClearConnect color touchscreen interface supports multi-touch gestures for intuitive control. It’s ideal for decentralized printing environments featuring work groups of CAD professionals who require both productivity and ease of use. Now printing is as clear and easy as using a tablet with the Océ ClearConnect Multi-Touch user panel. You can pan, zoom, swipe, spread and much more. Pull up a document, zoom and pan to different areas. See the orientation of documents with a live preview while scanning or copying to avoid errors. Save time with easy shortcuts. You can access your project documents directly at the printer using the Océ ClearConnect multi-touch user panel. Are your files on a USB stick, on a network location or in the cloud? Just browse and swipe to your files and print them. In addition, you can scan directly to virtually unlimited destinations in the cloud or your Intranet. Work Faster by minimizing waiting time and using less energy. 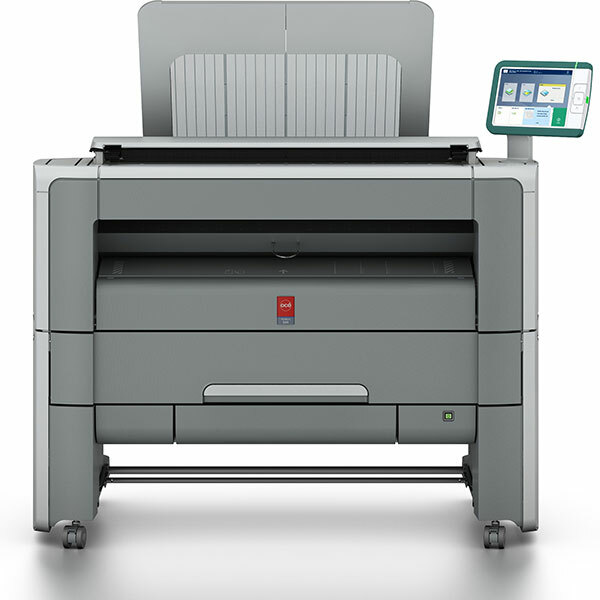 Print up to 4/6 D-Size/A1 plots in 1 minute, with virtually no warm-up time. From cold sleep to print in hand in less than 40 seconds. Compared to a slow 4 minutes with conventional printers. This easily saves you an hour a day in printing delays, increasing your effective speed up to 300%. No trade off between energy consumption and getting a fast first print thanks to the energy efficient Océ Radiant Fusing Technology. Don't buy Océ Plotwave 340/360 without contacting Napco. Call us today at 1-866-752-6766.